The kitchen is the hub of most homes, it’s where the family comes together each morning and evening to talk about their day and eat a delicious meal. 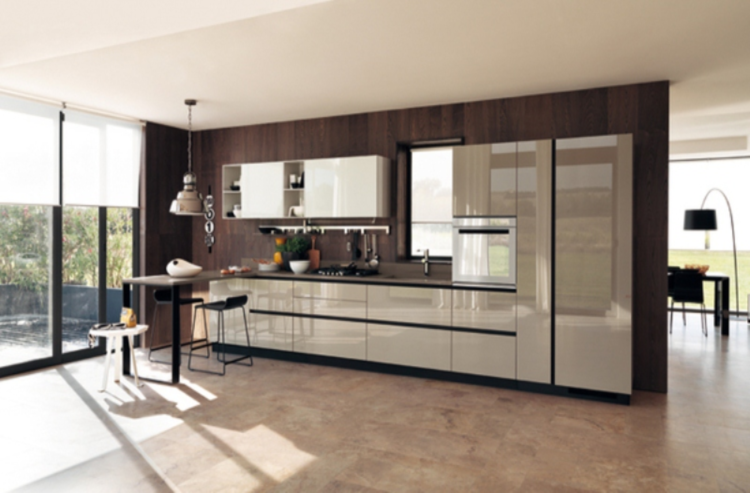 So how can you give your kitchen a fashionable flair and make it the trendiest in town? One of the biggest shifts in home design trends over the past decade has been the move to have a more open concept kitchen. In the past, kitchens have been refined to a small, individual room at the back of the house. These days, kitchens have been opened up to create larger kitchen diners with a dining table in the same room as the cooking facilities. They are even expanding to the point that the kitchen, living room and dining room could all effectively be the same area now, due to the open plan living preferences. As colour themes go, black and white will never go out of fashion. The idea of a black and white colour theme is that the strong contrast of these two colours creates a striking and fashionable style for your interior. If you don’t know where to start, then a great idea is to choose black kitchen worktops, they are smart and won’t need to be kept as spotless as if they were white. A nice touch is to keep all your cabinets the same colour and then contrast them with handles of a different shade. Colours aren’t the only way to bring a new style to your kitchen, lighting can make a huge difference. There are tons of different lighting options available, its just a case of deciding what suits your needs the best. Gone are the days of crammed in cabinets, these days its all about keeping your kitchen utensils on display and making your kitchen feel bigger and more spacious. Shelves can be installed into the walls and baskets can be hung for extra storage. If you want to take it a step further you can even just remove your cabinet doors. This is a great way to create a trendy and bohemian kitchen. It is also very easy to do yourself without having to undertake too much of an overhaul while still transforming your kitchen and giving it a fresh new feel. Every kitchen tends to host a certain number of features including a fridge, dishwasher, washing machine etc. But that doesn’t meant that they need to be the first thing you see when you walk into the room. A current trend involves hiding away a number of these features using cabinet doors that match those in the rest of your kitchen. Streamlining your appliances into the rest of your kitchen design means the room will have a seamless and stylish finish. As they say, “you’ll always find me in the kitchen at parties” - and you certainly will if your kitchen is fitted out with the trendiest products and designs available.